TUESDAY, MAY 7, 2019, 10:00 and 6:00 PM: LET’S GET PICKLED CLASS. 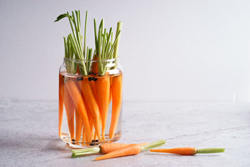 Pickled Baby Carrots – made with Champagne Vinegar using a shelf stable canning method, including mustard seed and celery seed. As Bambi has expressed on her website, whether or not you have ever canned, she will instill confidence in you to begin your own canning journey! Don’t miss this class! Classes will be at 10:00 AM and 6:00 PM. To make reservations for this class, please call the store at 209-728-8853. The registration deadline will be Saturday, May 4. The fee for this class will be $40. Bring a friend and get $5 off.